Rotork Skilmatic electro-hydraulic valve actuators have been ordered for increased safety ESD (Emergency Shutdown) duties on two new oil pipelines in China. Owned by the China National Petroleum Corporation, the Mahui and Yunnan Pipelines are attached to the network bringing oil and gas to China from offshore fields in the Bay of Bengal. The Skilmatic actuators will be installed in automated and unattended valve chambers at pump stations, where they will provide isolating and failsafe ESD functions. These valves, known as ROSOV (Remote Operated Shut-off Valves), are designed to isolate sections of the pipelines in the event of a potential emergency. By providing swift and accurate valve movement in one direction and very reliable mechanical spring return movement in the failsafe direction, Rotork’s self-contained electro-hydraulic actuator design is successfully utilised for this type of critical application in many countries. 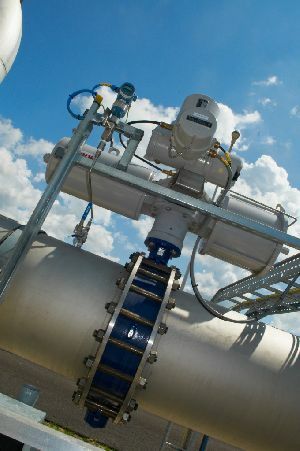 The Skilmatic actuator combines reliable failsafe performance with the benefits of Rotork IQ intelligent electric actuation technologies, facilitating remote supervision with a high level of asset management encompassing accurate control, monitoring and alarm signalling, operational data logging and diagnostics. The ESD function can be configured to operate on loss of mains power or control signal, with additional options including a second, independent ESD circuit and an ESD manual reset also available. Designed for functional safety applications SIL 2 with a HFT 0 to IEC 61508:2010 the Skilmatic actuator is also offered with a partial stroke testing capability, enabling the valve to be function tested without interrupting the process - performed either locally or remotely from the control room. The actuator is available with worldwide hazardous area certification, whilst the double-sealed electric enclosure is watertight and dustproof in ratings up to IP68 (submersion at 7 metres for 72 hours). Find out more about Rotork Skilmatic electro-hydraulic actuators.